A few months ago my mom gave me a vegetable spiralizer. I kind of forgot I had it and then one day I was trying to figure out what to do with all the squash I had, and decided I would try making zoodles (zucchini noodles). 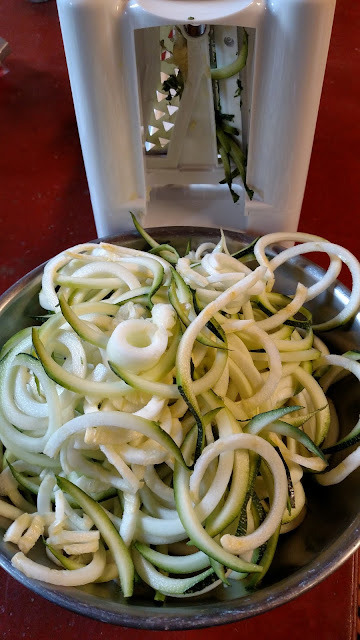 It turns out the spiralizer is super easy and quick to use. I made the zoodles and then went to work cooking a red sauce. The zoodles cooked rapidly - it only took about 3 minutes to sauté them. Much faster than pasta! Everyone in the family really liked the zoodles except for Reid. He complained a bit, but maybe if I make them more often, they will grow on him. What an easy way to use up excess squash! Excess squash is what summer is all about! Never have seen one, but by the pile of squash on the table need one.I am however a bit fussy about good pasta and how well its cooked. Maybe Reid is also. Those might be good to add to stir fry near the end since they cook so quickly. That looks good! 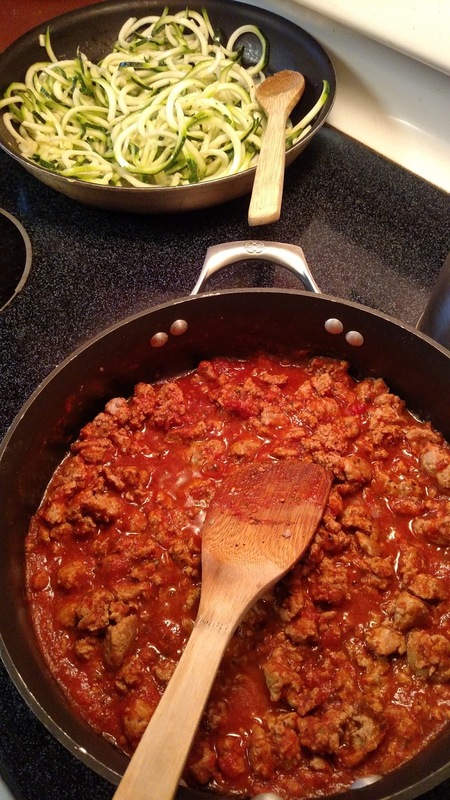 Did you just sauté them to tenderness, or did they have same consistency as pasta? It looks delicious AND pretty too! ZOODLES! Okay, I totally have to do that. I'm forever looking for new ideas for my gluten free son, and talk about making vegetables fun! Wow, a great gift from mom! Delicious! what a fantastic idea - and it looks so delicious! Zoodles, huh? Love that name --and your dinner looked delicious.... I've never seen that gadget before---but it looks neat.... Thanks for sharing. It looks divine, AND fun!! We love zoodles! Hadn't thought to call them that! I need that tool though! Till now my zoodles have not looked like yours. Have made three batches of sauce for meals and freezer from our tomatoes.. great year for tomatoes, you too? I have a zoodle maker. It works well. Surprisingly, they don't taste bad. I will try sauteeing them next time. Previously, I nuked them in the microwave. What a neat gadget and a great way to use up what you have! The shape of each piece has come out good. taste of the food also belongs to the texture. I have one of those things. I use it some times. I forget about it a lot as well. Sounds interesting. I'll have to give it a try. We have some squash at my house that I wasn't sure what to do with. Great idea! I think I'll put a spiralizer on my wish list. I've been wanting one of those, glad you like yours.